Airlines have started to issue warnings as thousands of flights scheduled for Thursday and Friday in the Carolinas and Virginia as Hurricane Florence bears down on the East Coast have experienced delays or outright cancelation. 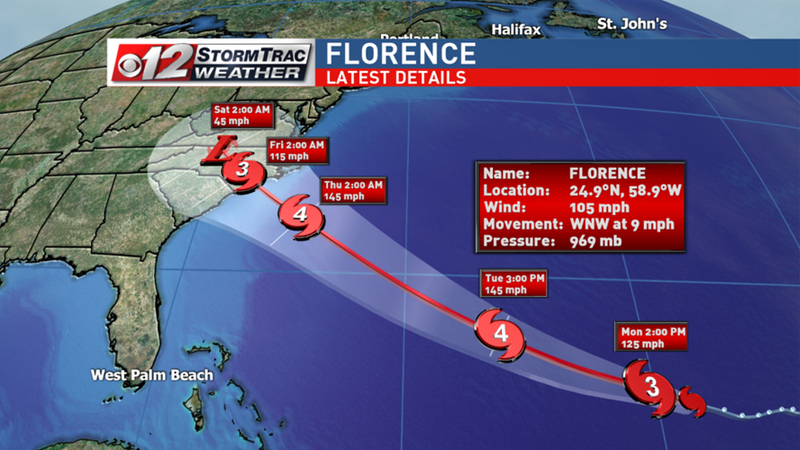 Hurricane Florence, rated a Category 2 hurricane is heading for the East Coast, affecting airports and flights in the Mid-Atlantic region. The storm was expected to hit North Carolina coast and in northeastern South Carolina on Thursday or Friday, while states like Georgia, Virginia, Tennessee and Kentucky will likely experience heavy rainfall, flooding and winds throughout the weekend. “Hurricane Florence is looking even bigger than anticipated. It will be arriving soon. FEMA, First Responders and Law Enforcement are supplied and ready. Be safe!” President Donald Trump tweeted early Wednesday morning. Charleston International Airport closed Wednesday night and will remain shut until at least Friday, a spokeswoman said. Operations were also suspended at several smaller airports in the region. Southwest Airlines said it plans to stop flying out of Charlotte Douglas International Airport on Thursday through at least Friday night. American Airlines canceled more than 700 flights in the region through Sunday but said it did not expect cancellations from its hub in Charlotte.